In 2016, the Thai government ratified the Convention for the Safeguarding of the Intangible Cultural Heritage, a UNESCO Convention. At present, the government is preparing an inventory of the intangible cultural heritage of the country. In 2017, the government made an nomination files to have “Khon (traditional mask dance drama of Thailand)” and “Nuad Thai (traditional massage of Thailand)” included in the Representative List of the Intangible Cultural Heritage of Humanity. The former will be examined at the 13th session of the Intergovernmental Committee for the Safeguarding of the Intangible Cultural Heritage in Mauritius, scheduled for November 26th through December 1st, 2018. 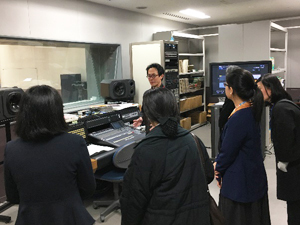 The objectives of their visit to Japan were to update themselves on the current condition of conservation and utilization of intangible cultural properties and heritage in Japan, which has years of accumulated experience in these activities, and to exchange ideas with Japanese experts. 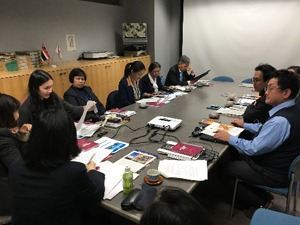 At this Institute, Thai and Japanese experts reported the current status of their respective intangible cultural heritage and discussed the issues common to the two countries, along with related questions and answers. Particularly, all the members recognized that how to hand down intangible cultural heritage to the coming generations is an important issue both in Japan and in Thailand. In the course of modernization, numerous traditional cultures have disappeared in Japan. Today, Thailand is experiencing rapid economic growth and accelerating development while facing the possibility of deterioration or extinction of its traditional cultures. Thus, the balancing of economic development with the preservation of culture is an important issue there. We believe that Thai people would be able to find a better way to hand down their intangible cultural heritage to future generations by referring to Japanese experiences not only of success but also of failure in preserving cultural heritage.